The Lasher Sport BT-X was specifically designed for our most active and adventurous users. 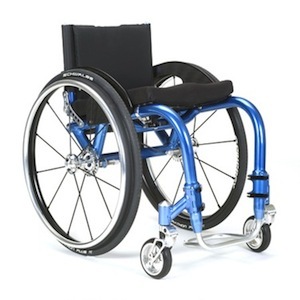 It features unique interchangeable wheel sets that easily connect to your chair with our Quick-Connect front caster assembly. Spinergy LX wheels come standard with high performance Schwalbe Marathon Plus Evolution rear tires. The multi-terrain package sports 25" Schwalbe Nobby Nic tires and 6” x 1.5” Quick-Connect casters for challenging trails and off road adventure. 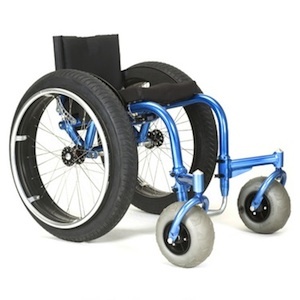 The beach package offers 4” wide beach wheels and 5” Quick-Connect beach casters to ensure extra stability on sand. Switching from everyday mode to multi-terrain or beach mode only takes five minutes and requires zero tools. The rear wheels are equipped with a push button quick release that makes it easy to swap out the standard wheelset with multi-terrain or beach wheels. The front caster assembly includes quick release flip-lock levers to quickly detach and switch between everyday mode and the beach or multi-terrain caster assembly. All wheels are pre-set and tested before they leave the Lasher Sport shop to ensure adequate clearance between the tires and seat. 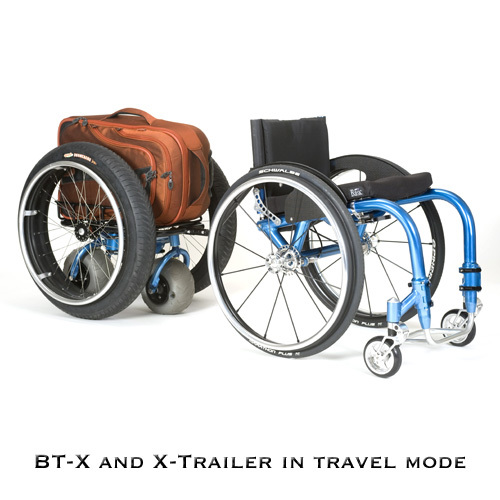 The BT-X also offers an attachable X-Trailer upgrade for each model that connects directly to your chair for superior hauling ability. The X-Trailer is designed to carry a standard airline carry on bag and can be taken through TSA security and stored under the plane at the loading gate which makes carrying gear around the airport easy and convenient. The BT-X offers a smooth ride in everyday mode and comes standard with high performance Schwalbe Marathon rear tires. 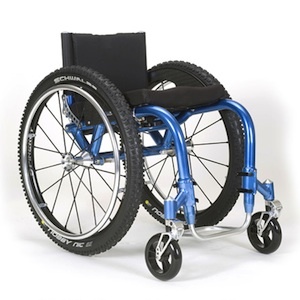 The BT-X is fierce in multi-terrain mode with customized front casters and 25" Schwalbe Nobby Nic tires. The BT-X Beach is ready for oceanside action with 4” wide beach wheels for extra stability on sand. 5" - 20" 5" - 20" 5" - 20"
* Component upgrade available. Please see order form for full component options and pricing.